Superbe tent in all respects save one: not much room for extended stays in tent during storms. The Polaris is a work of art-- eVent fabric means excellent breathability, the tent has a clever design and easy set-up. I've not used it on a big mountain, but for week-long ski-tours in the Sierra it has performed very well indeed. It is a joy to use this tent-- at 6'6" tall, I find it plenty long enough, and the vestibule is fine for cooking for two persons, as long as the vestibule door is open. Head-room is good enough. During longish storms, however, the tent does feel a bit less than roomy (it is not a base-camp tent), but we found it marginally liveable for two day snow-storms. I got an excellent price on the tent, otherwise I probably would not own it-- but if price is not an issue this tent is great. I also use 'Warmlite' tents for ski-touring and backpacking: the Polaris is not as light as my 3R Warmlite tent and it is not as roomy, but it will set up on a smaller platform, etc. I prefer the Warmlite for its incredibly light weight and amazing interior space (3-4 persons for a 3 lb tent is very nice! ), but the Polaris has a better vestibule, and the eVent fabric is tougher. It is possible that on a mountain, the tougher eVent fabric could be an asset if one has to pitch the tent on or near rock ('Liberty Ridge' in August, for example), and the Exped Polaris pitches on a much smaller platform than the Warmlite 3R tent can. The Warmlite is 'warmer' if it has the silver reflective heat barrier option, but the eVent fabric used in the Polaris is much warmer than ordinary polyester or ripstop nylon as featured in most other tents. Both tents use the tunnel design, and I would be hard pressed to give up either of them. Sure, I've used the North Face VE-25 on mountains like Denali, but I can think of no other use for that kind of big, heavy dome tent. The tunnel design is best for all-mountain use, I think, and the Polaris is just a perfect iteration of that design. Compared to any other tent I have used, the Polaris beats them all except that it cannot compete with a proper base-camp or dome style tent for sheer spaciousness, etc. So, I will hang on to both my Warmlite (for ski-touring with 3 persons in the party) and the Exped Polaris for mountaineering and two person ski tours. Thank you Karl, this is a tent I would love to have...but might have to wait on a bargain somewhere. Interesting tent B/C it'sade of eVent, my favorite WPB membrane.I think the Eddie Bauer First AScent Katabiatic is teh best bet for a 2 man winter tent at a reasonable price. 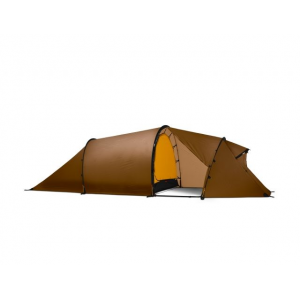 Of course Hilleberg has teh best winter tents going. I'm not sure which tent you were reviewing, the Exped or the Warmlite? You may want to add that the Polaris is completely free standing - no pegs. Its 50" wide (wide enough for the widest mats) and over 7 feet long. Fo a true mountaineering tent that should be plenty enough space. 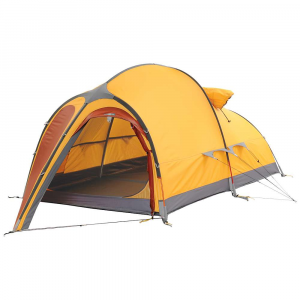 Its unfair to compare a 3/4 season 3 person tent to a 2 person mountaineering tent. Karl's remarks on the Polaris are spot on. Its one of the most beautiful and intelligently designed tents I have ever encountered. I own the previous version which allows you to install the 4th pole inside the tent as needed. The current version accommodates the 4th pole via an external pole sleeve. I've never encountered any problems setting up the tent when following the proper order as specified by Exped. Taking down the tent requires the poles to be pushed from the far end back through the pole sleeves at least half way before the poles can be extracted. Its simple and works well, and sure beats the heck out of the clip system or internal poles with multiple internal fasteners. All impossible to deal with when its bitter cold and you are dealing with gail force winds. Its a near perfect design for a tent in this class. I would prefer better topside venting options but I haven't really had any issues with the little chimneys. The overall quality of the tent is exceptional. The only other remark I would make about the tent is that I wish it were scaled up by 15% (No, the SD Convert 3 is NOT comparable! ).